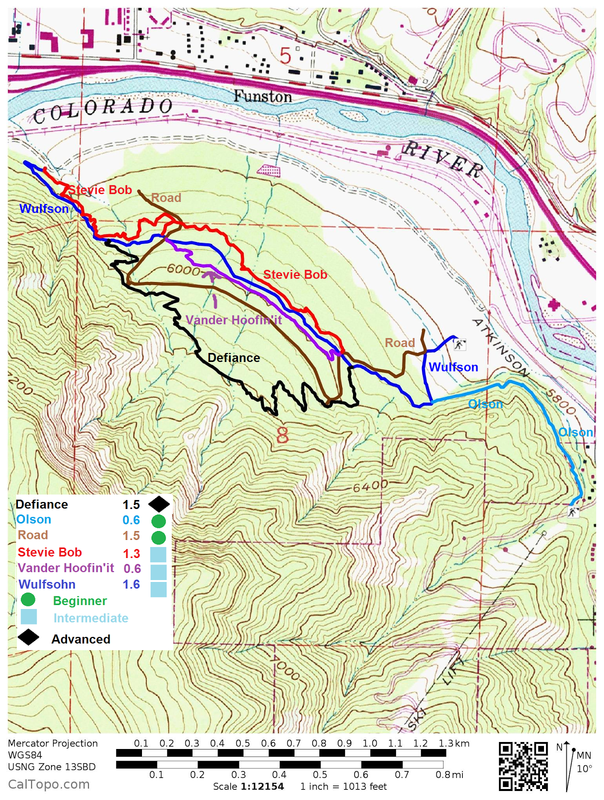 The Defiance trail is located in the Wulfsohn Mountain Park in Glenwood Springs, Colorado. The south end of the trail begins off of the Wulfsohn trail where it begins a steep climbing route up the mountainside. After gaining almost 300 feet of elevation the trail begins a longer more gradual descent to where its north end reconnects with the Wulfsohn trail. Measuring from the trailhead the south end of the Defiance trail is at about the half mile point of the Wulfsohn trail. For this post we rode the trail from south to north but having done so we would probably choose the other direction next time since it is a more gradual climb. If hiking or trail running we would probably stick to the south-north direction. There isn't anything murderous about the climb going in this direction but there are one or two spots that have a pretty steep slope. One advantage of going from south to north is that the trail is less rocky and better packed on the south end making it a little easier to ride. The profile map tells a lot of the story as far as the elevation change goes. The average grade is 10% with the steepest slopes hitting up to 24%. This is a picture of one of the steeper sections that goes on for a pretty good stretch. The side of the trail drops off sharply on the downhill side in a few places. Close to the quarter mile point from the south end of the Defiance trail a short connector comes up that leads to the road. This connector and another one that is near the north end of the trail would allow the Defiance trail to be combined with the road to create a loop that would cut out most of the up and downhill portions of the trail. After the initial climb the trail does a lot of meandering around where it becomes pretty sweet. From the trails highpoint it begins a long descent. The north end of the trail is a lot rockier and not as well packed. Seeing that the trail was relatively new when we rode it for this post it will probably get better packed as time goes on. Several bridges make a couple of the washes more manageable. There are also a couple of sharp switchbacks near the north end of the trail. The Defiance trail is a good addition to the other trails in the Wulfsohn Mountain Park. It adds a bit more of a challenge than the other trails offer. 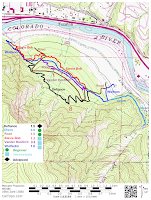 If it doesn't prove challenging enough a person could always use the Olson trail to connect it to the Red Mountain/Jeanne Golay trail for a more epic outing. Hats off to the volunteers that helped build the trail. It looks like they had an awful lot of brush to cut and rocks to move. If you would like to see it for yourself then all you have to do is 'Take a hike'.